Select from disposable to maximum durability, plus frames and handles. 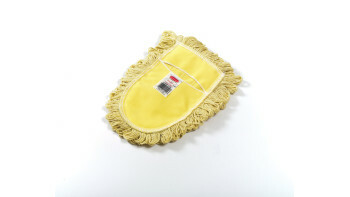 The Rubbermaid Commercial Disposable Cut-End Cotton Dust Mop is great for general cleaning. 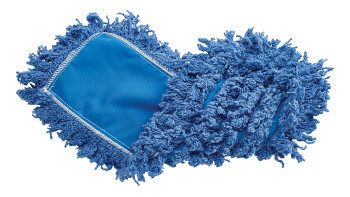 Blended Cut-End Disposable Dust Mop 24" has soft, open-twist, blended, cut-end yarn for increased dust pickup. 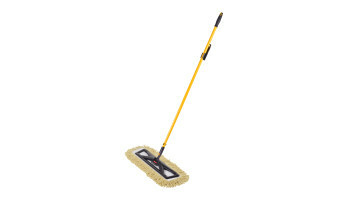 Trapper® Dust Mop 18" FGJ15303YL00 is a looped-end, balanced-blend dust mop for general-purpose dust mopping. 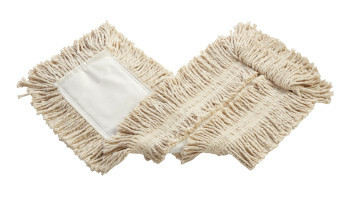 The dust mop head is for use with the wire frame mop handle. 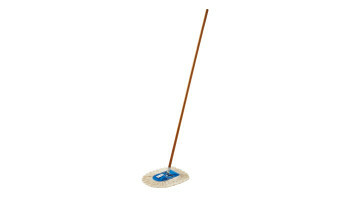 The floor mop has a wood handle with heavy-gauge plated wire frame. 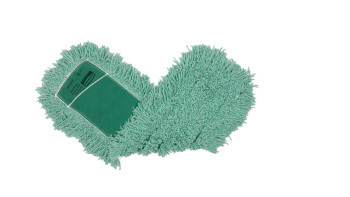 It is ideal for spot dust mopping in tight corners, under equipment or behind furniture. 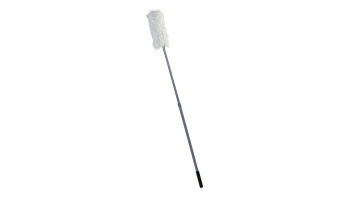 Trapper® Dust Mop 12" FGJ15100 is a looped-end, balanced-blend dust mop for general-purpose dust mopping. Pretreated, preshrunk, and fully launderable for long product life. Slip-on backing for easy setup. All-sewn construction. Recycled content: up to 65% post-industrial cotton and 35% PET plastic. 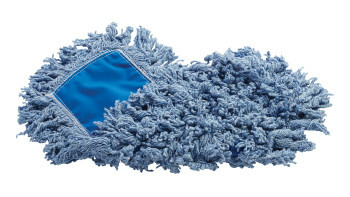 Twisted-Loop Blend Dust Mop 18" FGJ25200 is a premium prelaundered dust mop that provides maximum durability and optimal cleaning performance. Twisted loops create fuller mop heads with no gaps, offering better coverage than traditional ply yarn and improved collection and retention of dust and dirt particles. Less prone to snagging, fraying, and unraveling. Slip-on backing for easy setup. Durable polyester backing designed for launderable printing. 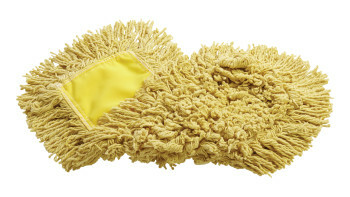 Recycled content: Yellow Mops are up to 62% PIC and 10% PET; Blue Mops are up to 65% PIC and 35% PET. Handles sold separately. 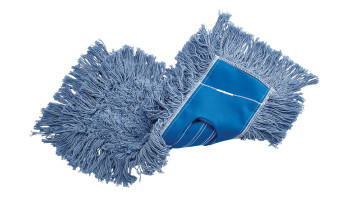 The mop is for use with the Trapper® looped-end or Kut-A-Way® cut-end triangle-shaped wedge mops. The floor mop has a wood handle with heavy-gauge plated wire frame. 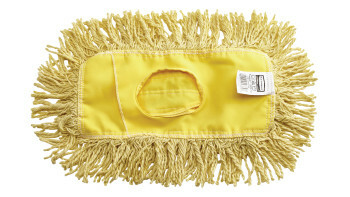 It is ideal for spot dust mopping in tight corners, under equipment or behind furniture. 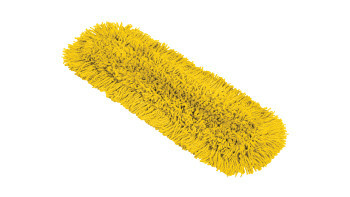 Kut-A-Way® Dust Mop 18" FGK15200 is a cut-end mop excellent for general-purpose dust mopping. 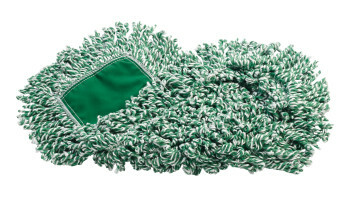 Twisted-Loop Blend Antimicrobial Dust Mop 24" FGJ55300 is a premium prelaundered dust mop that provides maximum durability and optimal cleaning performance. 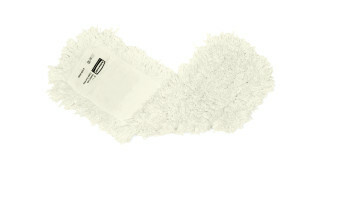 Twisted-Loop Synthetic Dust Mop 18" FGJ35200 is a premium prelaundered dust mop that provides maximum durability and optimal cleaning performance. 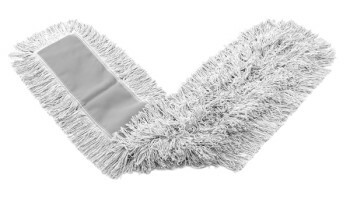 Twisted-Loop Cotton Dust Mop 24" FGK75300 is a premium prelaundered dust mop that provides maximum durability and optimal cleaning performance. Microfiber Loop Dust Mop 18" features the cleaning power of microfiber combined with famous high-quality Rubbermaid construction. 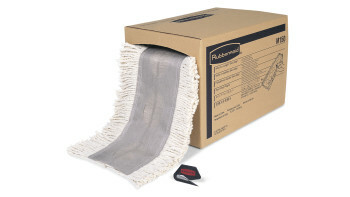 The Rubbermaid Commercial Cut-to-Length Dust Mop comes in a 40-foot roll, and cuts big floor cleaning costs down to size. The dusting tools have a frame and handle combined with the dust mitt to provide effective, convenient off-the-floor dusting. The dusting tools have a flexible head that conforms to virtually any shape. 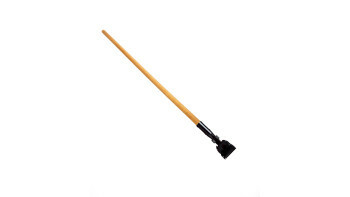 Snap-On Dust Mop Handle FGM11600 is an easily sanitized, snap-on, hardwood handle. 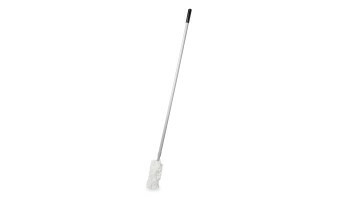 Snap-On Dust Mop Handle FGM13600 is an easily sanitized, snap-on, vinyl-covered, hardwood handle. 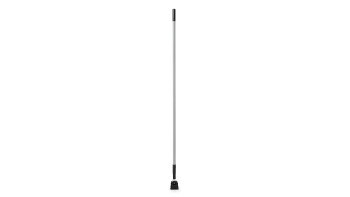 The Rubbermaid Commercial Snap-On Fiberglass Dust Mop Handle is resistant to corrosion and offers a high strength-to-weight ratio. 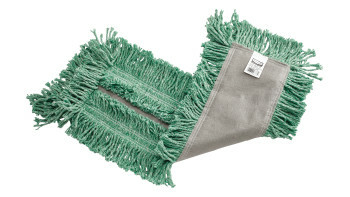 Ideal for spot mopping in tight spaces and under equipment and fixtures. Rugged wooden construction. Heavy-duty metal frame. 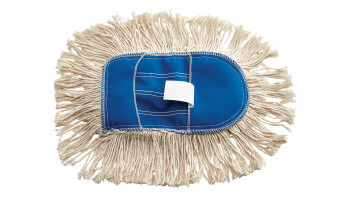 Accommodates Trapper® and Kut-A-Way® mop heads. 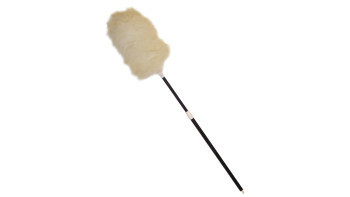 The duster with telescoping black plastic handle has a lamb's wool head. The plastic handle is durable easy to use. Ideal for commercial, industrial, and home environments. Its handle extends to clean hard-to-reach surfaces or high ceilings. The sensible solution to routine overhead dusting. 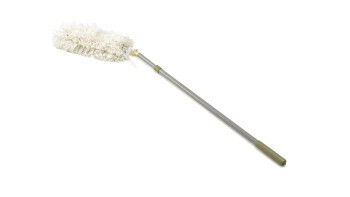 This flexible dusting tool extends up to 8 1/2 feet to make cleaning higher ceilings easy. All HiDuster heads are launderable for long product life. 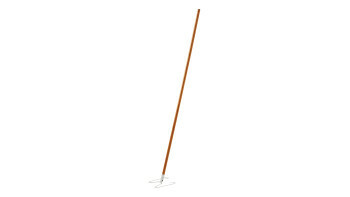 This overhead dusting tool extends up to 8 1/2 feet to easily clean higher ceilings. 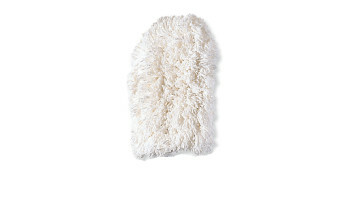 The dusting tool heads are washable to help them last longer. The tools feature a telescoping handle for simple and efficient overhead use. Has a telescoping handle that extends from 61 to 102-inches to reach overhead surfaces and ceilings. It has a lightweight handle for good strength-to-weight ratio and corrosion resistance. Replacement heads are available to extend product life. 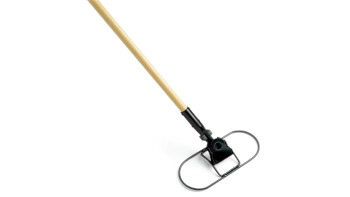 Snap-On Wire Dust Mop Frame 12" FGM25100 is a corrosion-resistant frame. Powder-coated. Heavy-duty metal frame for durable performance.